The 2019 Annual SaaS Trends Report is now available, and is based on data from the 2018 calendar year. Last year, 2017, saw a slight slow-down in the pace of new SaaS subscriptions, but an increase in the amount being spent on SaaS. So while it may look like we are starting to see some consolidation around tools, it’s also true that organizations are not shy about shelling out for software as a service that will help them grow and manage their businesses. Receive a free PDF eBook of the entire 2018 Annual SaaS Trends Report. It’s important to pay close attention to how software is being used in the modern business, because it’s the backbone of our economy today. Understanding SaaS trends can help businesses make good decisions about where to invest their own money. Additionally, digging deep on what’s working and what’s not can help uncover opportunities to improve. As we’ve written about before, SaaS security has a long way to go. Additionally, there are often major opportunities for cost savings when teams pay attention to where they are investing their dollars to avoid feature overlap and optimize resources. Productivity can either be dramatically improved or hampered by technology, depending on how workflows are structured, so periodically evaluating your SaaS usage (and taking a look at the wider industry) is a good way to understand whether you are moving in the right direction. Overall, it’s a good idea to pay attention to where SaaS momentum lies before you make any big decisions about where to invest, where to cut back, and how to better integrate and structure the technology your team already uses. Our hope is that this guide will help you do just that. The last ten years have resulted in a penetration of SaaS across all departments. While engineering was an unsurprising early frontrunner, and still a spending leader, Business Ops has taken the crown when it comes to number of subscriptions recent years. In 2018, it’s clear that SaaS is used widely across the entire organization. On average, we are seeing 18 SaaS subscriptions and about $136,000 in total spend at each company. However, it’s worth noting that as of Q3 2017, the run rate was closer to 20 subscriptions and $186,000 in annualized spending, so we expect these numbers to grow in 2018, just as they have in previous years. Let’s take a look at a departmental breakdown in SaaS usage and trends. AWS: No one who works in the cloud will be surprised to find AWS at the top of this list, as the top cloud infrastructure provider out there. Google Cloud: Google Cloud hasn’t captured quite the market share that AWS has, but they are also a frontrunner in the cloud infrastructure game. New Relic: A “digital intelligence platform,” New Relic offers deep and wide insight into how your entire stack is performing, and has long been a favorite among devs. GSuite: Not shocking to find the suite of apps that runs so many of today’s businesses here. GSuite is a favorite of ours for its ease of use, comprehensiveness, and security features. NetSuite: Need to manage your business’s financials, operations, and customer relations all in one place? NetSuite has your back. 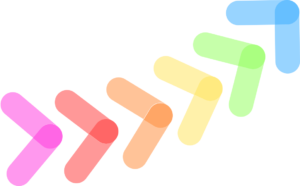 Slack: Perhaps the hottest communication tool on the market today, Slack is popular for its ability to replace email and bring teams into closer alignment. Plus, it’s fun to use. Hubspot: No surprise this all-in-one marketing automation tool rises to the top, given it is able to scale up or down for everyone from SMBs to the enterprise. Marketo: Another marketing automation SaaS winner, Marketo is a popular tool among enterprises. Clearbit: Clearbit enables marketers to better understand their prospects, empowering the marketing department with data-driven insights. Zendesk: A popular all-in-one customer service platform that offers everything from live chat to help desk to ticketing and more. Front: A shared inbox for teams, Front makes it easier to interact with customers without dropping the ball along the way. empowering the marketing department with data-driven insights. Time to get your financial house in order? In 2018, you’d be hard-pressed to do this successfully without the support of some excellent SaaS finance tools. While security and compliance concerns (and perhaps a bit of an old-school attitude) led to slow growth in this department—which averaged just one subscription as late as 2011—it has clearly taken off in recent years. The best apps for their money? Recurly: As its name hints, Recurly offers a smart platform for companies who bill on a subscription basis. Zuora: Similar to Recurly, Zuora offers a subscription management platform that is well-liked by businesses who need to manage revenue closely. Bill.com: This service not only helps businesses get paid, but also helps them manage payments to vendors and contractors themselves. FullStory: Want to understand how your customers are interacting with your platform so you can improve the experience? FullStory’s the tool for you. Typeform: Most businesses need at least some forms on their websites, and Typeform offers a well-designed, streamlined way to build them. Zeplin: Need to shorten the path between design and development? Zeplin makes it easy to collaborate and ensure the final product looks exactly how it should. Heroku: This cloud platform enables companies to build, deliver, monitor and scale apps without worrying about infrastructure requirements. Joyent: Billing itself as “next-generation cloud,” Joyent offers computing, storage, and analytics for any type of infrastructure, including containers. Datadog: Monitoring and analytics for your entire technology stack, offering visibility and insights. BambooHR: A powerful platform that includes everything from applicant tracking to self-onboarding to HR reporting. Gusto: HR, payroll, and benefits, all in one—plus access to HR experts on demand—makes this a popular choice for SMBs. Zenefits: This tool has something for everyone, from HR pros to customers to benefits brokers, offering a streamlined way to handle payroll, benefits, compliance, and more. Salesforce: A lumbering SaaS giant, Salesforce offers pretty much anything a sales team could ask for, from opportunity tracking to proposals to analytics—and beyond. Outreach: This sales engagement platform helps teams fill the pipeline, book meetings, and find out which sales tactics actually work. InsightSquared: Time to show the board how things are going? InsightSquared turns data into clear, actionable revenue reports. The SaaS explosion is a good thing. It’s easier to deploy and faster to adopt, and it doesn’t require IT or developers to get started. Even less tech-savvy team members can deploy many SaaS products. People prefer it because apps can solve a wide range of business challenges. But when an organization invests in a lot of apps, it can lead to chaos pretty quickly. You have to consider how certain tools get along (or don’t) with other tools. You need to look for ways to streamline tech-heavy workflows. You need to ensure you are meeting security and compliance requirements and responsibilities, and treating customers’ data with the level of respect and sensitivity it deserves. You also need to ensure you are optimizing both operations and spending around SaaS tools, so that proliferation doesn’t equal waste. Investing in software as a service responsibly means addressing these challenges. That’s the only way to ensure your organization sees a net benefit from all that amazing technology. Sound hard? Don’t worry. Blissfully helps hundreds of companies effortlessly manage their SaaS vendors, across thousands of subscriptions and millions in monthly spend. Once installed, Blissfully displays both historical and up-to-the-minute accurate representations of SaaS usage, spend, and data management. True Spend & Usage Data. The data in this report is representative of actual spend and usage from hundreds of companies leveraging Blissfully to manage SaaS across their organizations. The majority of other reports published on SaaS trends are based on surveys asking business and technology leaders to recall usage at a specific point in time—leaving the analysis and conclusions open to much bias and subjectivity. We report on hard data. Unique Historical Data. 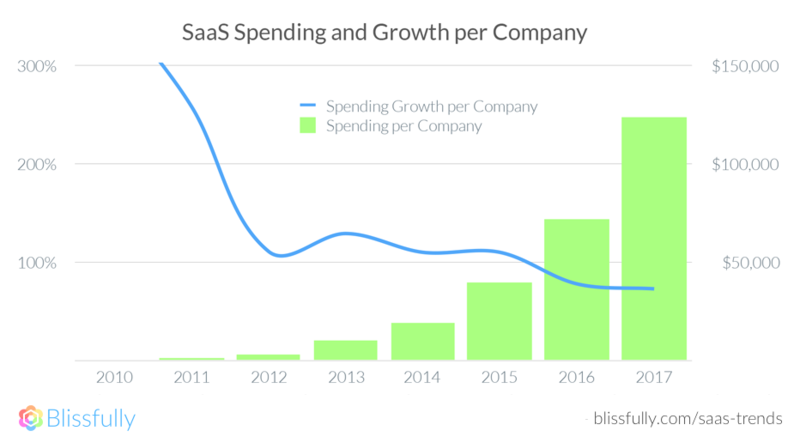 The data in this report offers arguably the most representative, historical view into SaaS spend and adoption since 2010, pulled through Blissfully’s proprietary data aggregation methods. Proprietary Data Aggregation. The data in this report is triangulated from three proprietary sources and methods developed by Blissfully to help organizations manage their SaaS products: single sign-on authentications, accounting integrations, and automatic invoice and receipt aggregation.